On a recent trip through Michigan, I had the pleasure of stopping at Siciliano's Market, a haven for homebrew supplies and craft beer. I was surprised to find that they also carried some teas, which could be purchased in bulk. Several of them stood out to me, and I am looking forward to bringing you reviews of those. 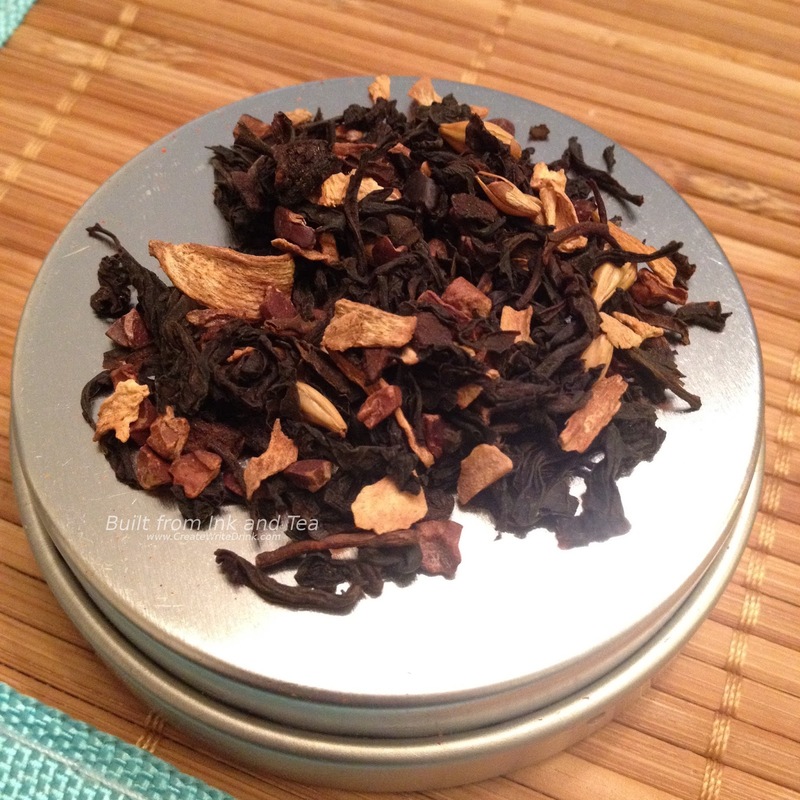 Here we have the first: Mayan Chocolate black tea. 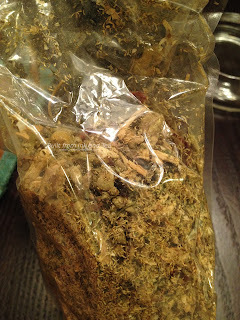 Inspecting the dry ingredients, it appears this tea uses a plain black tea base and blends with it cocoa nibs, dry ginger, cardamom pods, and perhaps pepper. The aroma of the dry leaf is heavy on the coca with distinct ginger notes following. 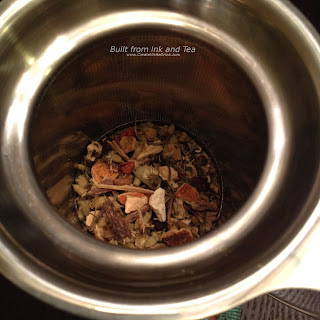 Using twelve ounces of water and a teaspoon and a half of the tea, I steeped the Mayan Chocolate blend for three minutes. 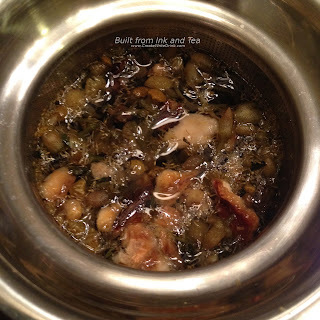 The resulting tea smells much warmer, in an ingredient rather than temperature sense, than the dry mixture. Cocoa notes still feature prominently, but some spiciness of pepper and cardamom accompanies them, and the ginger has diminished slightly. 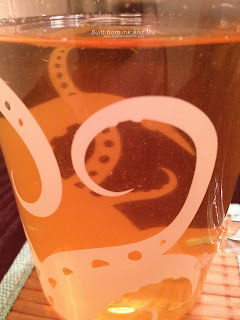 My first taste reveals that this tea could have withstood another minute - at least - of steeping without becoming bitter. The ingredients balance each other quite well. Cardamom, pepper, and cocoa stand foremost among the flavors. The ginger gives it a bit of an after-bite, so that - following the swallow - the cocoa and warm ginger settle over the tongue with just a hint of sharpness. In some ways, Mayan Chocolate is reminiscent of an actual cup of hot chocolate, yet the level of light, natural sweetness seems much preferable to an overly-sugary cup. This was definitely a tasty tea. If ever you are passing through Grand Rapids, Michigan, I highly recommend stopping at Siciliano's Market and taking a look at their tea selection! On my personal enjoyment scale, I would rate this Mayan Chocolate black tea a 4. Siciliano's Market's Mayan Chocolate black tea is available at their store in Grand Rapids, Michigan. You can find more information about their store from their website, here. 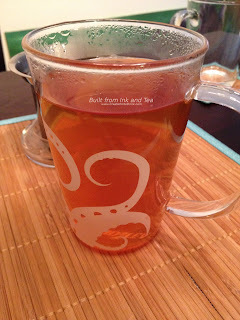 The choice for today's Tea Review Tuesday comes from DavidsTea. An herbal blend, whose ingredients are suggested for soothing the throat, Bravissimo seemed the natural pick for me, today. My own throat had felt a bit sore, and I thought Bravissimo might help! In addition, one of the primary ingredients of Bravissimo is licorice root, which happens to be a personal favorite of mine. Using just-boiled water, I steeped two teaspoons of Bravissimo in a twelve ounce mug for a little over five minutes. The suggested steep time was four to seven minutes, and I figured these ingredients could stand a longer steep for more intense flavor. As I waited for the cup to cool a bit, after steeping, I sniffed the aromas, trying to pick out the individual ingredients. The chamomile, rosehips, and licorice root stood out most to me in the smell. Peppermint was present, too, though in the aroma it was fairly light. When I took my first sip, though, a whole different set of flavors seemed to wash over my tongue. 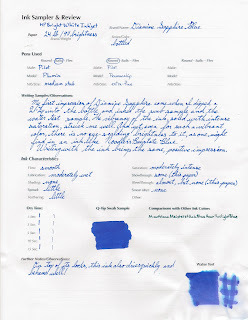 Peppermint and licorice root were prominent, while the finish tasted of chamomile and something else, something sweet. Goji berries, one of the ingredients, are not a flavor with which I am too familiar, but it could have been them or the influence of the orange peel. I felt that the rosehips were not too pronounced overall. DavidsTea's Bravissimo is available from their website, here. I have lost part of my handle on the personal enjoyment scale. That is, what defines (using that word loosely) my enjoyment now may be different than a year ago or five years ago. What good do my #/100 reviews do for you as the reader? Ultimately, these reviews are here for you to see my thoughts, but if those are unclear/ambiguous then the benefit drops immensely. In contemplating the revision of my scale, I thought through a few options. I could get rid of the scale entirely, though I personally like having some sort of quick reference for good-or-not (to me). I could use an established tea rating scale, but I am not a trained tea sommelier and do not have the authority for such. The scale could be revised to be a number from 10 instead of 100, yet how much difference would that actually make? It seems that more simplicity accompanied by greater definition is needed, while still keeping things personal. After all, these are my experiences. This lead me to the simplicity of a 1-5 scale. Defining each point, even vaguely, was more difficult. I really disliked this tea. While I may have finished the cup (as I rarely dump tea that I have prepared), the experience was not at all good to me (whether due to taste, smell, etc.). I would actually recommend against anyone drinking it. This tea was not great in my opinion. Maybe it had potential and then fell flat. Maybe it tasted "off" somehow. Maybe it was the tea embodiment of mediocrity. My experience with this tea was okay. I would drink it again, if it was an option, but I will not seek-out more for my collection. I really enjoyed this tea. I will be sad when the amount that I have is gone, and I may or may not buy more. I would highly recommend it. This tea was an absolute joy to drink. Likely, it is a tea that I will buy over and over again, so that I always have some. Yes, the scale is skewed more toward the positive. That said, I feel that rating teas and tisanes a 1 or a 5 will be rare. 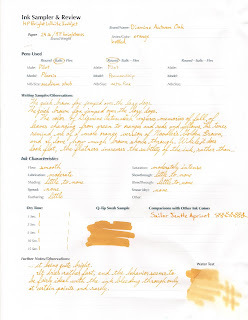 While I have tried more teas that I might deem a 5 than I have teas that would qualify for a 1, the number of teas that I would deem a 5 is a small fraction of those that would warrant a rating of 4. Starting with next week's review, I will use this new 1-5 scale. I do want to emphasize that the scale is not the focus of the review itself; it is the experience around which things center. The scale is merely a classification of sorts. For that reason, I will not be instituting any way to sort by rating. Rather, each rating should be considered as standing alone between me and the cup I just steeped. A tea that is given a great rating may not be the most expensive or the best quality of its kind, yet it may have given me an amazing experience in the drinking. If you have any thoughts on this new system, I would be interested to hear them! Please feel free to leave me a comment on this post or reach out to me via the contact link. It has been a while, since we featured a Mandala Tea offering here on the site, but I am excited for that to change! 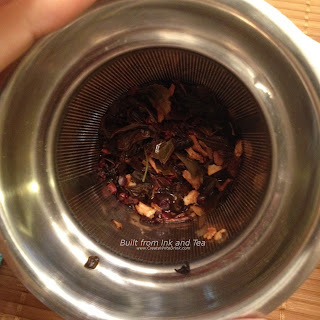 Today's review covers a tea sample that I received a while back with an order but never had the opportunity to try. While I see that it is currently out of stock on Mandala's website, I hope that it will be available again soon! 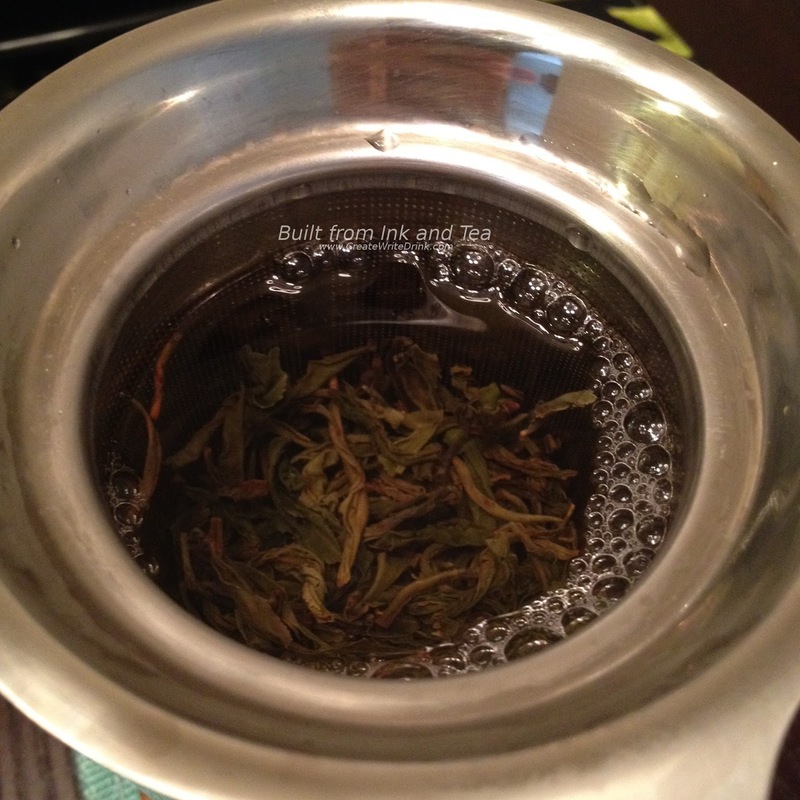 Enter Mandala Tea's Torch Festival Roasted Green. Torch Festival Roasted Green receives its name from the traditional roasting process in clay jars, which has been applied to this tea. Once I had decided to drink this tea today and read about it on Mandala's website, I got pretty excited; "a fiery cup in terms of flavor and potency" does not sound like my standard cup of tea! Preparing to brew the leaves, I was already being treated to some of the intensity. The dry leaves smell toasty in the same way that roasted vegetables might. Following the instructions on Mandala Tea's website, I gave these leaves a brief rinse, having added a large amount to my twelve ounce mug. (Not very precise measurements today!) 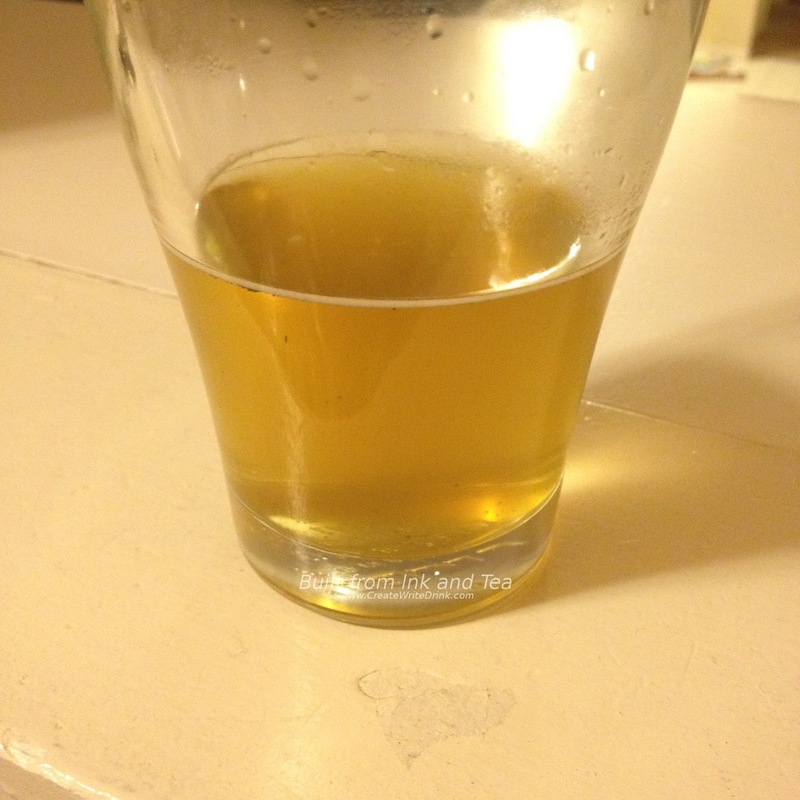 The suggested brewing style leans toward more leaves and less steep time, so that was what I intended with my cup. Following the rinse, a horde of roasted and nutty aromas rose from the leaves. Potent aptly describes the smell! Thirty to forty-five seconds of steeping later, I have a cup of Torch Festival that is releasing all kinds of roasted and dark vegetal notes. 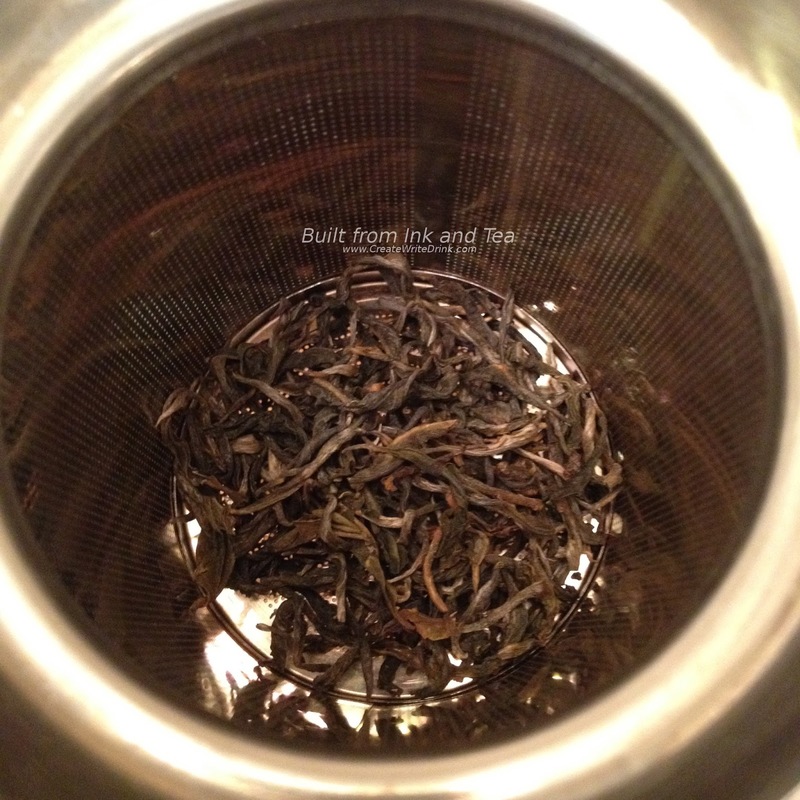 It almost reminds of a cross between the smell of a green oolong and a sheng pu'erh. Oh, the flavors. One sip and the flavors roar across the tongue, smooth and dark. The roasted green tea definitely carries nutty flavors, along with notes of damp earth, bark, moss, and maybe some mushrooms. Sounds strange? It just has me waxing poetic about the complexity of the leaf and the feelings evoked by the Torch Festival. On my personal enjoyment scale, I would rate Torch Festival a 95/100. Mandala Tea's Torch Festival Roasted Green is usually available from their website, here, though it is currently out of stock. Following on the heels of our review of Gourmesso's Black Infusion tea capsules, we had a strong desire to try the rest of their tea lineup. The next to be brewed was the Green Infusion. Gourmesso made identifying the tea used in their Green Infusion pretty easy. Their description from the box specifically says, "This gunpowder green tea is made from tightly rolled leaves, delivering a powerful yet smooth finish." Personally, I love a good cup of gunpowder green tea. Years ago, when I first started drinking tea, green teas were some of my favorites, and gunpowder was at the top of that list. Without having tasted the tea yet, my initial impression is that Gourmesso made a good choice in selecting gunpowder for their green tea capsule. It is one of the hardiest teas I have encountered, able to withstand some pretty hot water, and it brings a strong flavor to the cup. However, the time has come for some honest reaction. When I saw all of the rolled balls of gunpowder green crammed into the small capsule...it made me grimace. 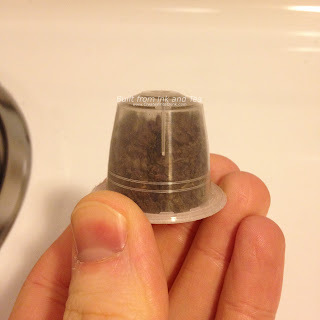 Given that gunpowder green is comprised of tightly-rolled balls of tea leaves, restraining them in a capsule instead of allowing them to open in an infuser basket (or other tea apparatus) does not make for a promising cup of tea. The water has less leaf area to cover. I started my tea preparatixon by running the Nespresso machine with no capsule to clear any coffee flavors or residue. Then, I inserted a Green Infusion capsule and ran the machine on the lungo setting, resulting in this half cup of tea. Once it cooled a bit, I thought back to gunpowder green that I had drank in the past. By comparison with other cups of gunpowder green I have had, this cup of tea smells quite strong. Likely, this is due to there being a larger leaf-to-water ratio, so that as the water passes over the leaves (versus sitting on the leaves, as in traditional tea making) it gathers more flavor. My first sip certainly tastes strong, too, with the flavors coating the tongue (not in a thick, artificial way). The finish surprises me, as it is rather smooth (relative to the strength of the tea). Gourmesso's Green Infusion is available from their website, here.